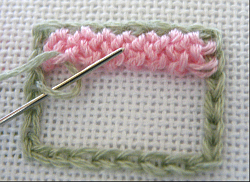 Begin your sample by making the chain stitch rectangle, eight chains across and six high, as shown on the main page. The first row is worked left to right, starting at the top left. Bring the working thread through in the centre of the first vertical chain on the left and insert the needle under the inner half of the second horizontal chain. 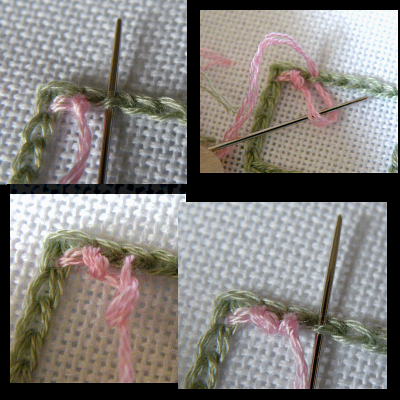 To work a knot in a left-to-right row: Pull the needle through, leaving a small loop. 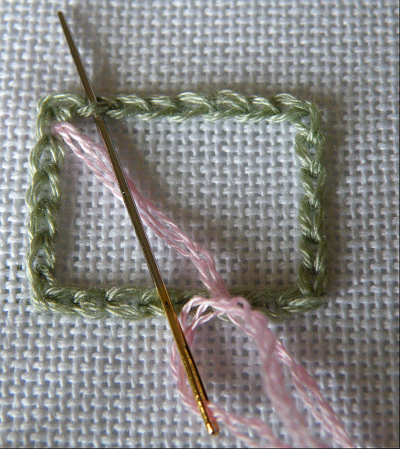 Keeping the working thread at the top, insert the needle under the left-hand side of the loop, from left to right, and bring it out through the centre. 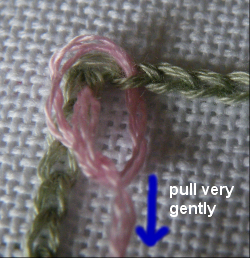 Gently pull the working thread downwards, and watch the loop twist and become a knot. A gentle, steady pull is needed to get the knot to sit in the right place. Once the first knot is formed, pick up the lower loop of the next chain. 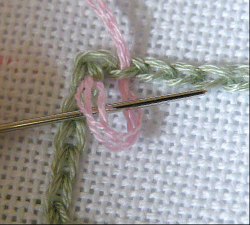 Pull the thread through and upwards, leaving a loop and then put the needle under the left-hand side of the loop, from left to right, close to the previous knot. Pull the thread through and pull it gently downwards to form the second knot. Continue to work one knot in each chain of the top row: a total of seven knots, as the first chain was not used. At the end of the first row, slip the needle under the inner edge of the top vertical chain on the right, and pull the thread through. 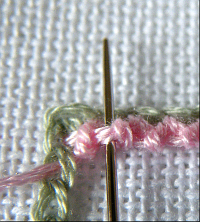 Then insert the needle into the bar of thread between the the last two knots of the previous row, to make the first knot of the second row. The seond row is worked from right to left. 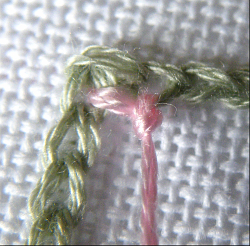 To m ake the right-to-left knot: pull the working thread through and upwards, leaving a small loop. 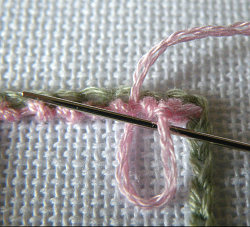 Keeping the working thread towards the top, insert the needle under the right-hand side of the small loop and pull the thread through and gently downwards. Continue making one knot between every knot of the first row: six knots. At the end of the row make a seventh knot on the bar between the first knot of the first row and the edging chain. Then take the needle under the inner part of the second edging chain. 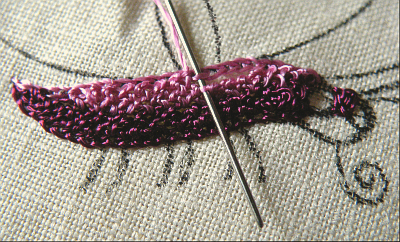 Pull the thread through, ready to start the third row, which is worked left-to-right like the first row. At the end of the third row, slip the needle under the inner loop of the next side chain. If you need to change to a new thread, always do it at the edge of a row. 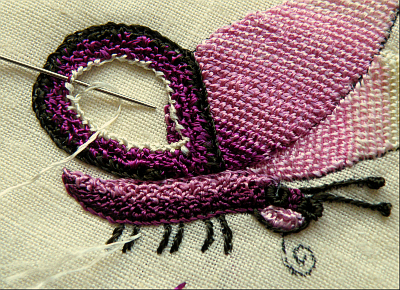 Take the old thread to the back under the chain stitch and bring the new thread through the centre of the next chain. When working trellis to-and-fro, all left-to-right rows start with a new chain at the right. All right-to-left rows start with a new chain at the left. To keep the number of stitches even, the first stitch of each row is worked between the last two knots and the last stitch of each row is worked between the first knot of the previous row and the edge. Continue working rows until you reach the start of the twelfth and final row. Pick up the inner loop of the second chain from the right, and then pick up the bar between the last two knots of the previous row as normal. 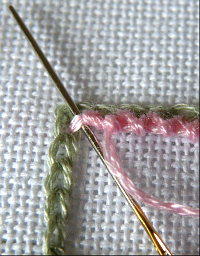 With both bars on the needle, work the stitch as normal. Continue to pick up one inner chain loop before picking up each bar. After the last knot is made, take the thread through to the back of the work. The sample is complete. 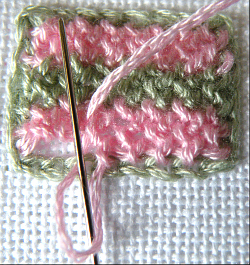 If you want to fill a shape other than a rectangle with trellis stitch worked in rows (either this variation or one of the others), you will need to know how to increase and decrease. 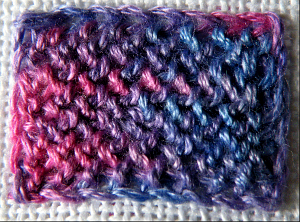 It’s very simple: increases are made by working two stitches into one bar, instead of just one. Decreases are made by skipping a bar and working into the next bar. The shaping is very like shaping in knitting or crochet. If you want your rows of trellis to be straight, across the shape, you need to make the increases and decreases at the ends of the rows. 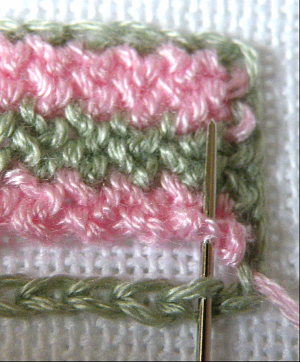 For a gentle increase or decrease, add or omit a stitch next to the edge chain at one or both ends of the row. For larger increases, you make extra stitches by picking up loops from the edge chains, and for decreases you bind off stitches by picking up the edge chains, just as you did with the final row of the sample. You can do the shaping by eye, increasing and decreasing to keep the stitching between the edge chains from getting too stretched (add stitches) or too bunched up (decrease a stitch or two). Knotty trellis worked to-and-fro on the body of this butterfly. I’m just attaching the last row to the edge chain. Curves as gentle as this need very little increasing or decreasing within the row. The natural stretchiness of the stitch can cope. Smooth trellis being worked to-and-fro in a teardrop shape. This does need occasional decreases around the curve, as well as at the point. The stitching on the right is detached buttonhole stitch. Filament rayon embroidery thread (similar to Marlitt) on an offcut of the fine linen I used for Strawberries and Gilliflowers. If you want the rows of trellis to curve, you can increase and decrease within the row, as shown in Variation Five.